A newspaper article from 45th Division News, a publication for the U.S. Army's 45th Infantry Division of the 157th Infantry Regiment. The article discusses a battle for the Seventh United States Army in the Vosges mountains. 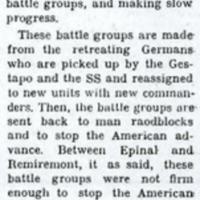 According to the article, American battle groups had forced the German Army to retreat. In the south, the French Army had reached the Belfort Gap but had made little progress. The 45th Infantry Division was part of the Oklahoma Army National Guard, with its members fighting in World War II and the Korean War. The division took part in the Allied invasion of Sicily and the attack on Salerno in the Italian Campaign in 1943, followed by the Battle of Anzio and the Battle of Monte Cassino in 1944. During Operation Dragoon, the 45th Division landed in southern France in latter half of 1944. In 1945, the 45th joined other forces for the Western Allied invasion of Germany, ending the European Theatre of World War II when Germany surrendered in May. Digital reproduction of original newspaper article: "Battle Groups Can't Halt 7th: French at Gap." 45th Division News, Vol. V, No. 10, October 4, 1944: 45th Infantry Division Museum, Oklahoma City, Oklahoma. Original newspaper article: "Battle Groups Can't Halt 7th: French at Gap." 45th Division News, Vol. V, No. 10, October 4, 1944: 45th Infantry Division Museum, Oklahoma City, Oklahoma. Originally published by 45th Division News. “Battle Groups Can't Halt 7th: French at Gap.” RICHES of Central Florida accessed April 26, 2019, https://richesmi.cah.ucf.edu/omeka/items/show/7004.